Ike the Network Guy: How to avoid Time Warner Cable's rental fee: Buy your own modem. 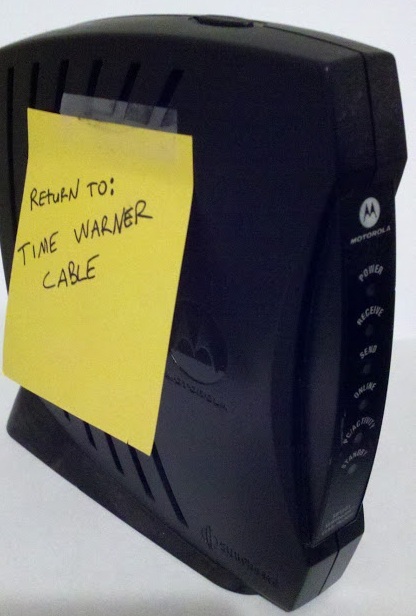 How to avoid Time Warner Cable's rental fee: Buy your own modem. Recently Time Warner Cable announced that as of 10/15/12 it would start charging its customers a "modem rental fee" at the price of $3.95 a month. You may have read about it online, seen it on the back of your paper cable bill or you may or may not have been aware about this new charge at all. However, TWC has allowed its customers to purchase their own modems (from a list of approved modems) and allow a waiver of the rental fee. So the choice is simple, you can go purchase your own modem or you can do nothing and pay the $4 a month. Either way it is important to think about your decision to act or not to act. First lets do some math. The modems for purchase in question, are going to run you anywhere from $50-$60 depending on where you find it. Once you purchase your modem that's all the money you are going to spend for it. If you do not purchase it however you will pay $4 a month for....how many months do you think you will continue having broadband cable internet; 2 years, 5 years? Or if you are like me, you never plan to see yourself without broadband internet. Then we are talking costs much higher than simply buying a modem. After about a year's worth of the fee (12 months X $4) you will have paid $48 dollars. That's pretty close to the cost of just buying a modem. So the modem will have paid itself off after a year. After 5 years (5 X $48) you will have paid $240 dollars, for a $50 modem. And for most of us, the modem that we go buy ourselves is the exact same model that TWC provided us. So deciding not to go out and buy your own modem and waive the rental fee is going to cost you more money in the long run. Which brings me to my last point. Some of you may read this and still be thinking "What!? Modems? I don't know anything about that, that sounds complex" Well I'm here to tell you it really isn't. Below are the simple steps to owning and setting up your own cable modem. Go to Time Warner Cable's website and consult their Approved Modem List, and find your approved modems. Most of us are going to be under Approved DOCSIS 2.0 Modems. (DOCSIS 2.0 just means you have standard internet package. If you were DOCSIS 3.0 'turbo' you would probably know it) But if you are unsure you can always call Time Warner cable and ask. Here is the link for their approval list. Buy one of the modems from the list. TWC even provides a list of good places to purchase your new modem. I would recommend Amazon.com, Walmart, or Newegg.com. Call Time Warner Cable and tell them you want to set up your own modem so you can get the rental fee waived. The Customer Service Rep will have you read the HFC MAC ID number that is located on the bottom of your new modem. (when reading the letters and numbers to them be very articulate. For example, N as in Nancy, B as in Bravo, etc) This number is what TWC sees to allow you to use their internet service). They will then tell you to hook up the new modem. Hook up the new modem. 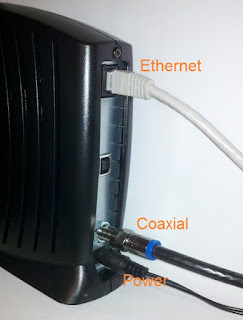 First unplug your Ethernet cable, then your coaxial cable, then unplug the power cable from the back of the TWC modem. Now just take your new modem and screw in the coaxial cable, plug in your Ethernet cable, and finally plug in the power cable. The modem will automatically turn on. Give it a few moments and then the phone person will tell you that they see your modem and have you test to make sure you have internet. Open a browser and go to a website and confirm that you are connected to the internet. It's as simple as that! Now you can rejoice in all that money you have saved yourself (after a year of course). Give yourself a pat on the back, you are now the proud owner of your very own cable modem! Now you can brag to all of your friends about the massive hardware upgrade you preformed. nice post, I get paper-less billing so I seriously would have missed this.